Norwegian Breakaway cruise ship’s senior management team, including the ship’s Staff Captains, Chief Engineers, Hotel Director, Assistant Hotel Director, Food and Beverage Director, Cruise Director and key department heads were announced today by Norwegian Cruise Line. These senior officers and managers will work alongside the previously announced ship’s Captains, Evans Hoyt and Hakan Svedung, and Hotel Director Denis Prugda, to deliver the Norwegian’s most innovative ship to date. Norwegian will take delivery of Norwegian Breakaway, the ship that will bring the best of New York City to sea, on April 25, 2013. Following inaugural festivities and a maiden transatlantic voyage, the ship will begin a series of seven-day cruises from New York to Bermuda. Seasoned officers, Staff Captain Niklas Persson and Matko Candrlic will be on board to introduce the vessel to guests during her very exciting inaugural season. As Staff Captains, they are second in command and report directly to Norwegian Breakaway’s Captain. They are responsible for the Deck Department and are versed in all of the responsibilities and duties of the Captain, so that they are prepared to assume command if necessary. The Staff Captains will also assist Norwegian Breakaway’s Captain with all operational issues, and all matters involving the safety of guests, crew, the ship and the environment. Persson joined Norwegian in 1999 and since has served as Staff Captain on board Norwegian Spirit, Sky and Jewel. When he is not on board, he enjoys spending time with his family in Sweden. Candrlic joined the company in 2003 and has held positions on board other ships including Norwegian Spirit and Norwegian Gem. He enjoys his time off the ship in Croatia with his wife and children. Carsten Fosbo will deliver Norwegian Breakaway in the position of Chief Engineer and when on vacation he will be relieved by Anders Nedal and Zoran Posa. The Chief Engineer has full responsibility of the entire technical operation of the Ship, plays a key role on the ship’s Senior Management Team and works closely with the Staff Captain and Hotel Director. Fosbo joined Norwegian in 1998 and has since served as Chief Engineer on various Norwegian ships including Norwegian Dawn, Norwegian Star and Norwegian Sky. Originally from Denmark, Fosbo resides in Costa Rica. Nedal joined Norwegian in 1986 and has worked on board Norwegian Star and Norwegian Gem. He spends his time away from the ship with his wife and children in his home country of Norway. Posa has been a member of the Norwegian team since 2002 and has spent the majority of his time working on board Norwegian Sun and Norwegian Sky. Hailing from Croatia, he spends his vacations there with his family. 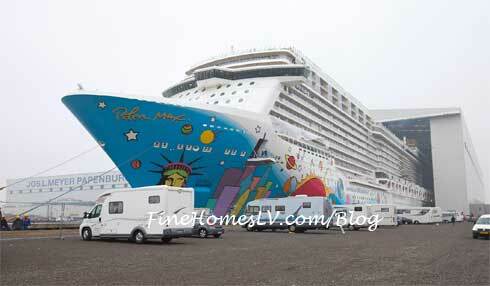 Wurmhoeringer played a key role in the successful launch and delivery of Norwegian Epic. When not on board, Wurmhoeringer enjoys vacationing with his family in Austria. Assisting the Hotel Director is Sonja Sommergger who will serve as the ship’s Assistant Hotel Director. Originally from Austria, Sommergger has worked with Norwegian since 2002, in various guest service roles and on various Norwegian ships including Norwegian Jade, Norwegian Gem and Norwegian Epic. Norwegian Breakaway’s Food and Beverage Director Martin Ivanov will oversee all of Norwegian Breakaway’s 28 different dining options. The role of Food and Beverage Director on this ship is complex, as Norwegian Breakaway boasts more restaurants than any other cruise ship at sea. With his previous experience on Norwegian Pearl, Norwegian Dawn and Norwegian Epic, home to 21 different dining options, Ivanov will bring a wealth of knowledge and experience to Norwegian Breakaway. Hailing from Bulgaria, he spends his vacation time at home with his family. Heading Norwegian Breakaway’s entertainment team is Cruise Director Julie Valeriote. With Norwegian since 1999, Valeriote has led entertainment teams on Norwegian Epic, where she was also part of the ship’s inaugural team, and most recently on Norwegian Pearl where she has cultivated a strong following of guests who admire her constant enthusiasm, positive energy and her incredible stilt-walking skills. When not on board, Valeriote spends her vacation in her home town of Wellington, Ontario. Norwegian Breakaway’s key department heads include: Executive Housekeeper Marites Sonza from the Philippines; Executive Chef Anilkumar Chinthapattla from India; Restaurant Manager Luiza Andrei from Romania; Beverage Manager Jose Contreras from Honduras; Human Resource Director Sue Hannon from the United Kingdom; Shore Excursion Manager Andrei Bruce from the United States of America and Photo Manager Martin Brooks from the United Kingdom. The cruise company will showcase Norwegian Breakaway to travel partners and media in both Europe and the United States during four inaugural sailings, prior to the ship entering weekly summer service to Bermuda from New York City. Following delivery on April 25, 2013, Norwegian Breakaway will sail to Rotterdam for a two-night inaugural cruise departing on April 26, followed by a one-night cruise from Rotterdam to London (Southampton) on April 28, and then a one-night inaugural event in London (Southampton) on April 29.